It was my husband's birthday last week and it is always a bit tricky to think of a card for him. He works in the recycling industry and was a Biochemical Botanist in his previous work, so I often tend towards plants and nature for cards for him. I've been very busy and must confess his birthday snuck up on me so I went to my stash and found this one. It uses the Faux Silk technique which is a cool technique where you stamp your images then cover them over with wrinkled tissue paper. And here we are with our grandchildren, enjoying a birthday picnic lunch in the park. 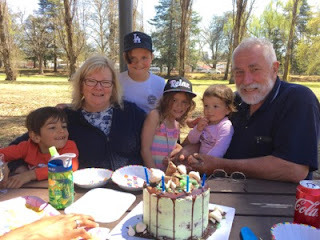 Doesn't that cake look delicious? One of our daughters made it - chocolate and mint - she is so clever and it was so yummy. 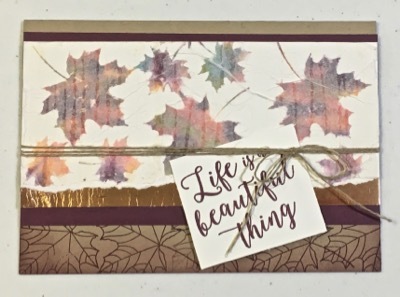 Finding the card inspired me to teach the technique to a new group of crafters last week and I stepped it up a bit by using the Baby Wipe technique to create our own multi coloured ink pads for the leaves. Colours I used are: Old Olive, Crushed Curry, Bermuda Bay, Tangerine Tango and Fresh Fig. 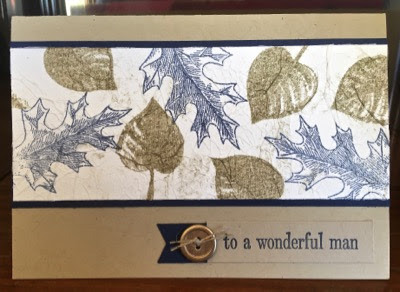 The leaves from the wonderful and versatile Colorful Seasons stamp set are perfect for both these techniques. The card base is Crumb Cake and the highlights are Fresh Fig and Copper Foil. I stamped the leaf vein images along the bottom of the card using Fresh Fig, which is rapidly becoming a favourite for me. A list of products for the lower card can be found below. Please feel free to order any products via my On-line store and if you would like further information on the techniques you are welcome to contact me.